Ambulances are parked outside the site of an explosion that occurred in a club, housed by the building in the background, in Bucharest, early Saturday, Oct. 31, 2015. Romanian police on Monday arrested the three owners of the Bucharest nightclub where a fire this weekend killed 31 people and left nearly 200 injured. The fire at the Colectiv nightclub started on Friday when fireworks set off inside the club lit insulation foam on a pillar and spread quickly, starting a stampede and trapping many of the roughly 400 people inside. The Romanian band 'Goodbye to Gravity' performs as fireworks erupt on the stage of the Colectiv nightclub in Bucharest, Romania, Oct. 31, 2015. Romanians, long critical of the way permits and licences are issued, blamed local authorities for failing to properly inspect clubs and other public spaces, expressing their anger on social media under the hashtag #CorruptionKills. After hours of closed-door hearings, prosecutors said they had issued 24-hour arrest warrants for club owners Costin Mincu, Alin George Anastasescu and Paul Gancea on suspicion of manslaughter. They plan to ask the court for 30-day warrants. All three men declined comment. "Data and evidence ... have shown the fire occurred because the people managing the respective space encouraged and allowed a number of people above the club's limit in a space that was not endowed with more emergency exits," prosecutors said. They said owners allowed "a fireworks show in the indoor venue that was improper as it ... contained easily flammable materials illegally installed to avoid additional costs." People, light candles, stand outside the compound that housed a nightclub where a fire occurred early Saturday in Bucharest, Romania, to pay respects to the victims, marking 24 hours after the accident, Nov. 1, 2015. 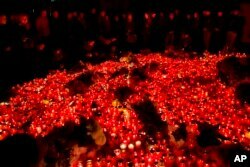 Hundreds of people gathered outside Colectiv on Monday to light candles and place flowers in remembrance of the victims, after thousands marched in silence through the city on Sunday. Blood donation centers across Romania were overrun with people, while volunteers took food and water to Bucharest hospitals for medical staff and survivors' families. The country's president awarded the national merit order to two of the victims, Adrian Rugina and Claudiu Petre, who died while saving others from the club. More than 130 people were still in hospital on Monday, with more than half in a critical condition, doctors said. The owner of Expirat, one of Bucharest's busiest nightclubs, tucked away in a basement in the popular Old Town, said he was shutting it down. "Starting today I can no longer risk lives," Andrei Sosa said on Facebook. 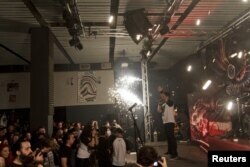 In the city of Brasov, club Rockstadt said it was closing to replace non-fireproof insulation and install sprinklers.